I’m a human centered designer who (1) empathises with the user experience, (2) defines user needs and product scope, (3) ideates with the entire business in mind (4) tests prototypes to maximise learning (5) measures results and continues to improve. Below, you'll see how I've advocated for our users' needs, guided our team towards human-centred design processes, and designed successful experiences across physical and digital touch-points. When I joined Nima, the brand was in a confused state. With only a confused styleguide to reference, Nima team members wasted time on unnecessary design decisions. By creating a clear styleguide, I could save my team hours of time and prepare us to grow. Feedback from my design mentors was clear: by improving our logo and simplifying our usage of colour and type, I could make the Nima brand appear more professional and trustworthy to our customers. Led a brand strategy meeting with CEO, CTO, and Director of Product to align on goals and update our brand values and messaging. establish trust with dark blue with honey yellow accents. I made Nima's logo visually professional by improving the relationship between the heart and "NIMA"
I created brand styleguide and mission/values documents within a few days, gathering feedback from team-members to optimise its usefulness and clarity for their needs. Our new brand guidelines save team members hours every week. They save me hours too, and help me focus on UX decisions without worrying about UI decisions until it's time for UI. Customers, when interviewed or surveyed, find the brand entirely trustworthy and professional (7.5/10 rating), so they can focus on evaluating how the product fits their life. 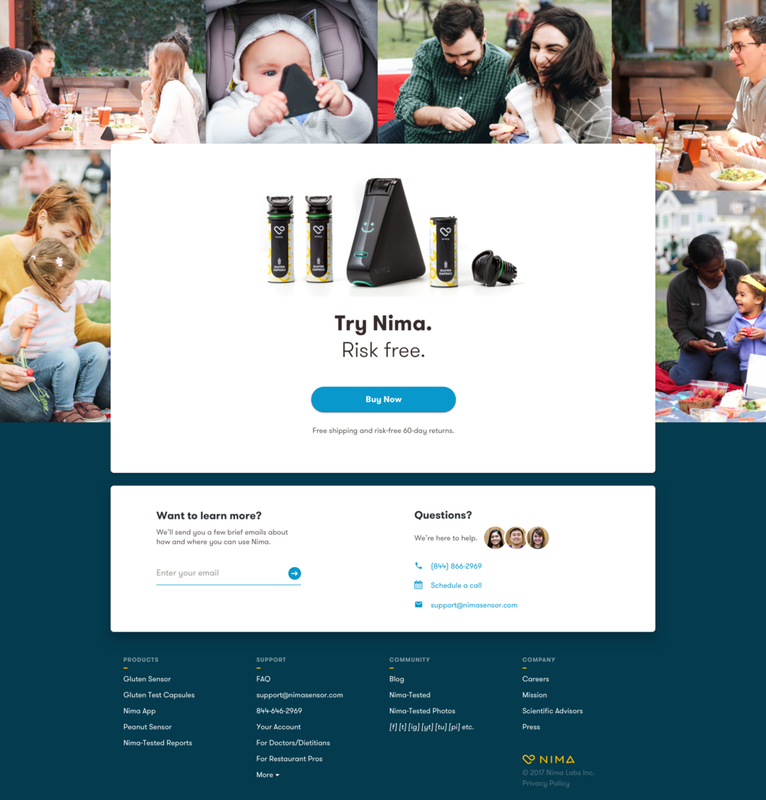 Nima is an entirely new product category -- none of our users are familiar with portable food testers before Nima. For that reason, I needed to use photography to communicate what the product was, how to use it, and how your life would improve with it. I led our photography to best supported the user experience. First, show me what the product is. Then, show me how to use the product. Last, inspire me about the new lifestyle I might live. I created photography guidelines, above, and art-directed a contracting photographer, Maggie, and led two photoshoots that matched Nima's two primary use-cases: out at a restaurant and at a social/buffet gathering. I art-directed contract photographers, Nat and Cody, in a photoshoot for Nima's new Peanut Sensor. Based on user interviews and survey results, I chose foods that were of primary concern for users allergic to peanuts. Quantitatively, Click through increased 41% from our landing page to our product page after implementing this new photographic story. Read the Web Design case study for more. Qualitatively, customers often praise our photos (especially the one with the baby and Nima) when they talk to our support team or share comments about Nima on social media. Nima uses Photography to communicate its function and purpose. However, Nima's digital products and email experience needed a few key moments of emotion. So, I led our illustration efforts to focus on surprising and delighting our users in those few key moments. I walked through our iOS app with 2 active and 2 inactive Nima users. This user research decision meant I received diverse, valuable feedback. These insights were also informed by our engagement numbers (# of test results contributed per user) and onboarding conversion rate. The engaged users, who contributed their results often, wanted a stronger sense being thanked. The disengaged users, who had never contributed their test results, wanted a warm welcome with clear steps on what to do next. I created illustration guidelines, above, after internally testing 4 different style directions in the span of one day with our contracting illustrator, Frankie. 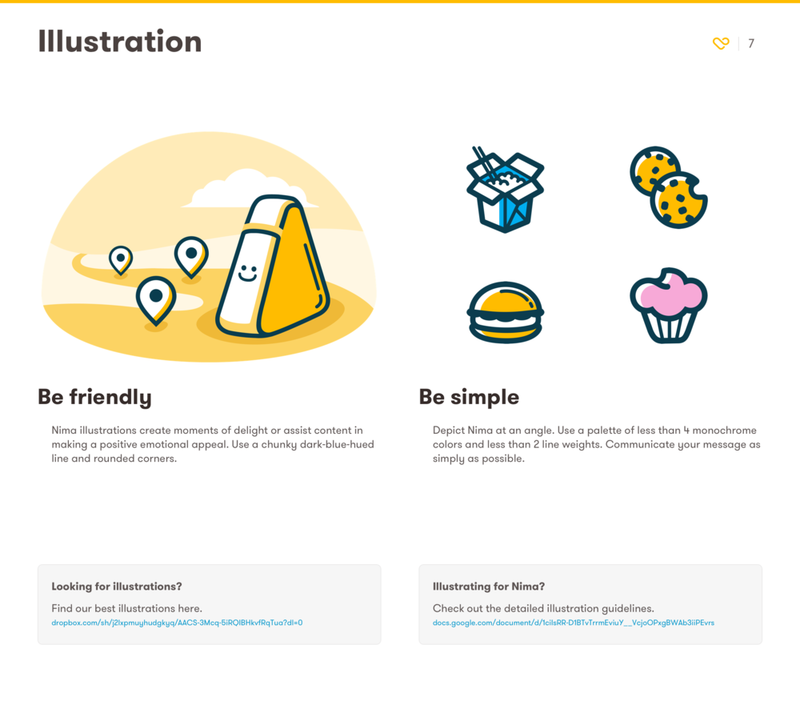 I art-directed her illustrations and updated our app design to celebrate them. We repeated this process for several key moments in our email experience for potential Nima buyers interested in learning how it fits in their life. % of Contributed Tests increased 240% after redesigning the contribution flow, which featured a big illustrative thank you as the "Reward" at the end. 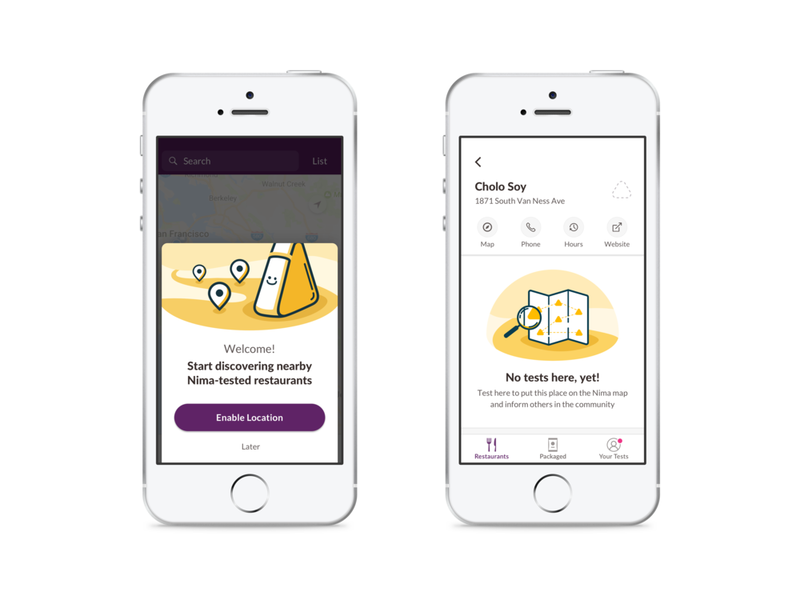 See the Mobile App Design case study for more. With a warm welcome, significantly more users paired their device and contributed their first test result. Over 40,000 tests have been synced from 1000s of users. 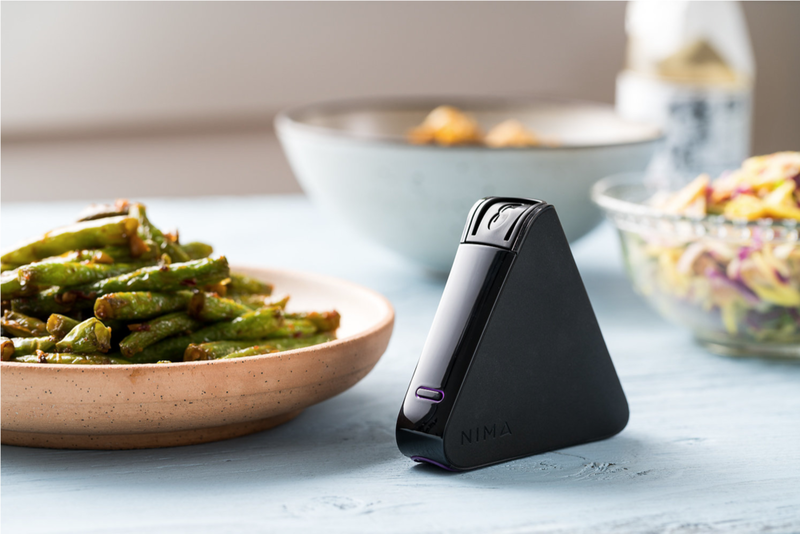 At the time, Nima's Gluten Sensor was on the market and we were developing the Peanut Sensor for those with peanut allergies. We needed a peanut icon for our our products' plastic bodies, product packaging and wrappers, and also across the web and app experience. Separately, we also needed to improve all the icons the Nima hardware device displays on its screen for consistency and comprehension. 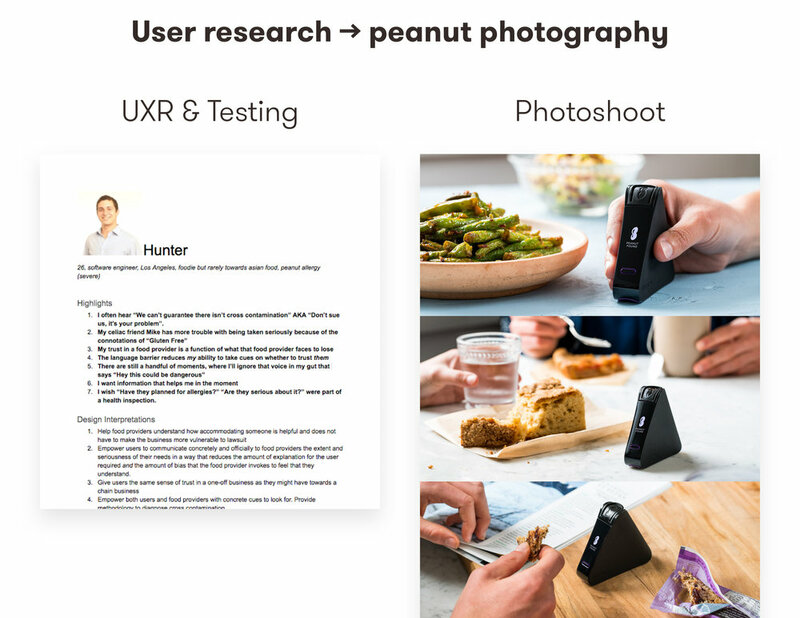 Based on qualitative feedback from 60 users in Nima's earlier Gluten Beta Tester program, the team already knew the peanut icon would have to be totally clear yet positive. Finding peanut contamination in your food is a highly negative experience. However because Nima let you know, now you won't get sick. You can reframe the result into positive action to remedy the situation. In two exhausting days, I assembled iconographic inspiration and ideated in a variety of visual directions until arriving on a successful Peanut Icon and set of Firmware Icons. I worked with our mechanical engineers to avoid geometries that could not be injection molded. I worked with our firmware engineers to make designs look sharp on our device's screen and improve the UX of the Loading Animation so a user would know when their test would be ready. I updated Nima's already social-media-famous Smiley Face Icon (which means Gluten-Free or Peanut-Free) to look more professional without losing its well-loved goofy quality. Based on our Support Tickets, I updated all the icons the Nima hardware device displays on its screen to fix confusions that users expressed. I validated all designs with 2 non-tech-savvy users to ensure they were understandable. Support tickets related to device usage decreased 62%, because now users received instant and clear feedback about loading state and error states. Peanut Sensor Beta Testers often commented on how much they loved the peanut icon. It was totally clear yet emotionally positive. Because Nima's Smiley Face result icon was already so well loved on social media, I was concerned that our existing users would dislike the new design. However, it was received with love. It was warming to see dozens of Instragram posts with the new Smiley Face right after we shipped the Firmware Update. Nima's new box was designed by an industrial design consulting firm. However, I tuned up its language and layout for improved clarity. I led the design of the materials most critical to a successful first-time user experience -- the Quick Start Guide -- and successful ongoing experience -- the Pocket Guide. A clear list of steps for their first test, including the final step of contributing their result on the Nima app. They needed to see these steps before anything else distracted them. Separate pages helped them get a "lay of the land" without flipping back and forth. A list of the most important tips that answer common usage questions. These insights along with our Support Team's analysis of common usage questions helped me design the QSG's content. I worked with our manufacturing engineers to properly spec manufacturing documents so our Chinese manufacturing partner could put the QSG into production and assembly. A list of exceptions of foods Nima cannot test, to frequently double-check. Clear tips on how to address test errors, which feel stressful and disappointing in the moment. I designed and refined the QSG and PG to be simple and clear. Also, I employed a few illustrations at emotional moments where users benefited from a warm welcome. I validated both the Pocket Guide and the Quick Start Guide designs with 2 non-tech-savvy users to ensure they were understandable. In a follow-up survey, 40% of respondents said they carried their Pocket Guide in their wallet and consulted it regularly. Peanut Beta Testers, the first recipients of the new Quick Start Guide, found it helpful (7+ on surveys). None had difficulty doing their first test, which is a significant improvement compared to our old QSG.